After being ‘thrown into the fire’ as a rookie from South Carolina State due to a Cameron Heyward injury, Steelers DI Javon Hargrave has a better idea of what to expect as he enters his second NFL season. Heading into the 2017 season, Hargrave figures to be the team’s starting nose tackle starting alongside a healthy Heyward and Stephon Tuitt. 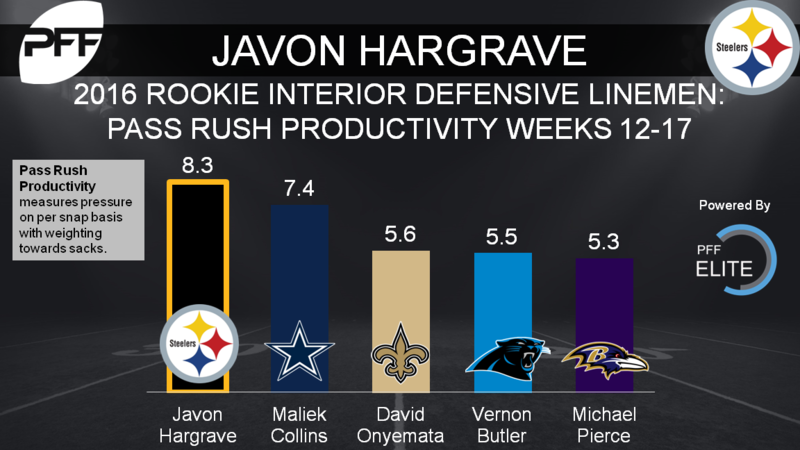 Hargrave responded in a big way down the stretch of his rookie campaign, as his pass rush productivity of 8.3 from Weeks 12-17 ranked 11th among all interior defensive linemen with at least 57 pass rushing snaps. In 2016, Hargrave’s PFF grade of 70.0 ranked 51st out of 127 eligible interior defensive linemen. His pass rushing grade of 69.0 ranked 42nd.